The University of Notre Dame will play a major role in the international celebration of the centenary of Ireland’s 1916 Easter Rising, which was announced Tuesday (March 31) in Dublin by Taoiseach Enda Kenny. 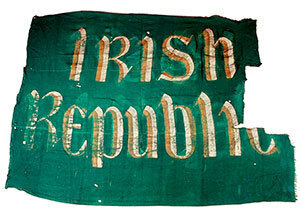 A documentary television series, “1916: The Irish Rebellion,” produced by Notre Dame’s Keough-Naughton Institute for Irish Studies, will be broadcast worldwide during the centenary, which memorializes the events in Dublin on Easter Week a century ago, when an insurrection started a process that culminated in an independent Irish state and accelerated the disintegration of the British Empire. The three-episode series, directed by award-winning Irish documentary maker Pat Collins; written by Bríona Nic Dhiarmada, the Thomas J. and Kathleen M. O’Donnell Professor of Irish Studies at Notre Dame; and narrated by Oscar-nominated actor Liam Neeson, will follow a chronological narrative while presenting the historical, political and cultural events of the uprising and the new and lasting relationships among the United States, Ireland and Britain that it brought about. Aired on American Public Television (APT) in the United States and Raidió Teilifís Éireann (RTÉ) and the British Broadcasting Corp. (BBC) in Ireland, the series also is intended to air on other broadcasters in Great Britain, Australia, New Zealand, India, Canada and Europe. A 70-minute film version of “1916” will be screened globally to the world’s Irish embassies during the centenary celebrations as part of the Irish government’s outreach to the 70 million people of the Irish diaspora. According to Christopher Fox, director of the Keough-Naughton Institute, “1916” is an unprecedented attempt to present the Easter Rising as a pivotal event in world history before a global audience. Among the numerous international scholars contributing to the series are several from Notre Dame’s faculty, including Declan Kiberd, Donald and Marilyn Keough Professor of Irish Studies; Robert Schmuhl, Walter H. Annenberg-Edmund P. Joyce Chair in American Studies and Journalism; Patrick Griffin, chair and Madden-Hennebry Professor of History; and Kevin Whelan, Michael Smurfit Director of the Keough-Naughton Notre Dame Centre in Dublin. “1916” will be featured in a series of international academic events sponsored by Notre Dame in cooperation with Irish embassies and consular services during Ireland’s centenary celebration. Collectively titled “Reframing 1916,” the series will bring several Notre Dame faculty to speak at universities worldwide, screening and discussing the documentary. Originally published by Michael O. Garvey at news.nd.edu on March 31, 2015.